Liberty City administrative offices are located at 101 East Kansas Avenue, Liberty MO 64068; phone: 816-792-6033. Photo: Clinton House, ca. 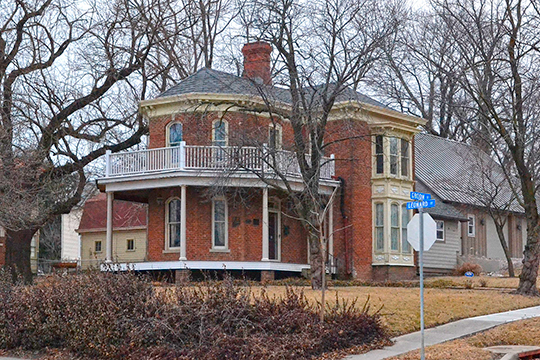 1889, 404 South Leonard Street, Liberty, MO. Listed on the National Register of Historic Places in 1978. Photographed by User:25or6to4 (own work), 2018, [cc-by-4.0 (creativecommons.org/licenses/by-sa/4.0/deed.en)], via Wikimedia Commons, accessed July, 2018. Liberty is the second oldest town incorporated (1829) west of the Mississippi. The city is home to William Jewell College, one of the oldest private colleges in the state, founded 1849. Liberty's notable dates include 2/13/1886, believed to be the site of the very first daylight bank robbery (Clay County Savings Bank); legend states the perpetrators were the James-Younger gang. Liberty, Missouri is the county seat of Clay County, one of thirteen counties comprising the Kansas City metropolitan area. The City is located fifteen miles northeast of downtown Kansas City. Residents enjoy the rural aspects of Clay County and the proximity of cultural and recreational activities of the metropolitan Kansas City area. Liberty is home to 8 districts that are listed on the National Register of Historic Places: Arthur-Leonard, Clardy Heights, Dougherty-Prospect Heights, Garrison School, Jewell-Lightburn, Odd Fellows Home, South Liberty Courthouse, and West Liberty Courthouse. Additionally, eight individual properties are also listed.